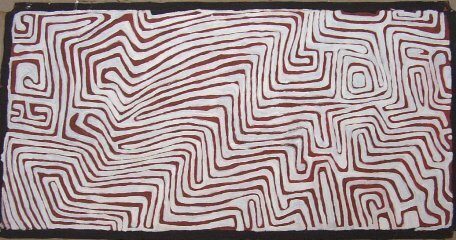 Kayili Artists, Gibson Desert, W.A. "Nyaurna-ngalku (wati tjilpi), one old purungu man is walking all around hunting for cooka (meat). He's carrying his tjara (shield), karli (boomerang), kurlarda (spear) and mirru (woomera). The area has a rockhole called Puyulkurra, it lies west of Patjarr, a long, long way away. It is desert country, where there are too many tali (sandhills). It's hard work walking around that place. Nyauruna-ngalku is walking all around, with no family, no wife, only one man." This story belongs to Mr Giles through his father.